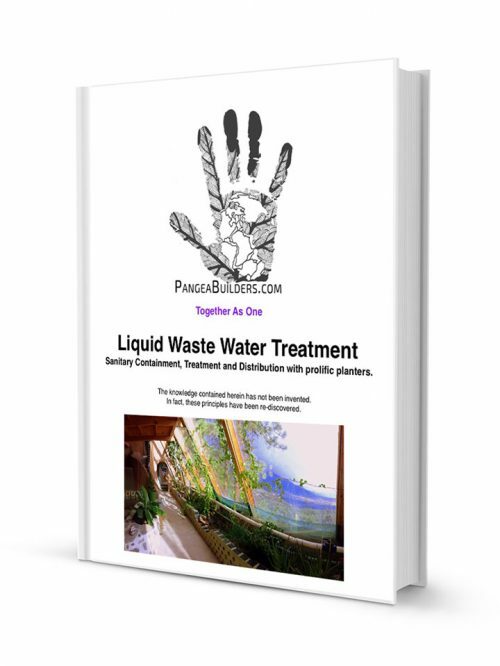 Our intention of this course is to teach you all about how to treat liquid waste water on-site, in a super sustainable way that meets and exceeds local health codes. 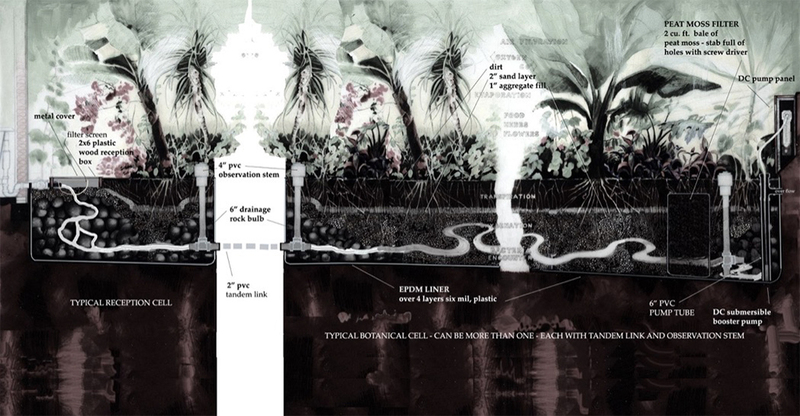 Understand how this system works, how it processes and treats greywater and blackwater, and how maintain this system. The liquid waste water treatment system is a containment, treatment and distribution system for liquid waste water. This system is similar to the wetlands concept which has long been used in exterior applications for thousands of years by humans and nature. This system differs from the wetlands approach in that it treats and processes the ‘untreated greywater’ inside the building and the liquid waste water from the toilet outside of the building. The botanical cells are plumbed with overflow lines to the conventional 3” septic line out. The design and layout of the plumbing system is completely normal and conventional. The system outlined meets all International Building Codes. The system is set up (via valving) creating loops. These loops have the botanical treatment cells within them. These loops can be completely by-passed via valving. This does not replace place conventional plumbing, the system outlined is in addition to convention plumbing. Greywater is untreated waste water which has not come into contact with toilet waste. Greywater includes waste water from bathtubs, showers, bathroom wash basins, clothes washing machines, and laundry tubs, or an equivalent discharge as approved by the Administrative Authority. It does not include waste water from kitchen sinks, photo lab sinks, dishwashers, or laundry water from soiled diapers. Surfacing of greywater means the ponding, running off, or other release of greywater from the land surface. Greywater is used for irrigation or other uses such as filling toilet bowls. In 1997, in California grey water was approved for use in commercial, industrial, and multi-family projects. Prior to that, it was only available in single family homes. A permit is required to install greywater systems in California, and they must be contained to their own property. The use of greywater results in lower fresh water use, less strain on failing septic tanks or treatment plants, less energy and chemical use, reclamation of otherwise wasted nutrients. All of these benefits equal a savings in energy and the natural resource that is water. After water is used in sinks, showers and bath tubs, it then drains into the greywater planters. The ‘untreated greywater’ is treated in ‘interior botanical treatment cell’ (greywater planters). There is a diverter valve to send the ‘untreated’ greywater to the conventional leach-field instead of the interior botanical treatment cell. Clean and clear looking ‘treated greywater’ (not drinkable) is pumped to flush the toilet(s). Next the water goes outside to a conventional septic tank (can be solar heated to enhance the anaerobic process). This unit functions like a regular septic tank (only better). There is a diverter valve to send the toilet water out to a conventional leach-field instead of the next step, into an exterior botanical treatment cell. After the septic tank, the liquid waste water goes in to an exterior botanical treatment cell(s) (size and quantity varies). These exterior planters are constructed very similar to the interior greywater planters. This facilitates total containment of remaining effluent and directs its use toward exterior landscaping. After this use the water again tests below measurable nitrate levels. The botanical cells (planters) are lined and filled with large rocks, smaller rocks, dirt, topsoil and are sloped with a deeper well at one end. The well fills with greywater that did not get used up by the plants. The greywater in the well has been treated by all the roots, good bacteria, oxygenation, etc. that occurs. This ‘treated greywater’ goes through a peat moss filter and is pumped through a charcoal drinking water filter, then sent to the toilet for flushing. The botanical cells are plumbed with overflow lines to the conventional 3” septic line out. The design and layout of this plumbing system is completely conventional. The system is set up (via valving) creating loops which have the planters within them. These loops can be completely by-passed via valving. This system does not replace conventional plumbing, it is in addition to convention. Multiple uses of all water that are healthy and efficient. Provide on-site, self contained treatment of liquid waste water. 25 sf. of planter space per plumbing fixture. The beginning of the planter should be as close to the kitchen sink as possible. The effort to contain the outdoor system rather than letting it leach into the earth is much more realistic and manageable because it is only treating toilet water. More treatment cells can be added if necessary. Multiple uses of all water where possible, healthy and efficient. Alleviate municipal sewer systems and provide on-site, self contained treatment of liquid waste water. gallon per person, per day (toilet drain water) x (w) (winter/dormant days) = volume of drainfield. There are 7.5 gallons in a cubic foot. Gallons per person, per day: a researched figure to use is about 29 gallons of toilet water produced per person, per day. A typical 2 person household will produce approximately 58 gallons of toilet water per day. Typical winters, dormant plant growing seasons last about 180 days. This figure will change depending on where your job site is located. The beginning of the planter should be as close to the toilets as possible. see construction drawings. Storing Greywater in a Tank. Don’t Do It. Exterior Botanical Cell, Pre-Treatment Reception. Cutting Holes in the liner for plumbing lines.